I wear ballet flats almost daily. I used to wear nothing but heels, but when I fell down 13 stairs carrying Nick when he was little (he was A-OK, thankfully), I ended up in a wheelchair for several weeks and with an ankle that has not ever been the same. For over a year, slippers and Birkenstocks were the only comfortable items for my feet. I can wear almost anything now (heels are great if I don't have far to walk), but look for well-made ballet flats in all different colors in the cooler months. I recently cleaned my desk drawer--a major task in my case because I put it off until I have no choice--and I came across an LL Bean gift card. I have to say I don't buy much at LL Bean--khakis for Tom because he's 6'4 and not too many places have the length he needs is about all I buy there. I do also like their basic crew neck slightly fitted sweater--especially in classic navy because I can wear it with ballet flats and my favorite dark flare leg jeans and be dressed in 2 minutes. I was looking over the site and I saw these cute and comfy looking ballet flats. I was hesitant to order them--nearly all of the comments in the on site review section came from women of retirement age. That's why I don't always like review sites to put age demographics. Anyway, I saw them in eggplant suede and decided to order them with my gift card. They are the most comfortable ballet flats I own. I own several pairs in everything from shiny silver to red and black patent leather, and the basics as well. 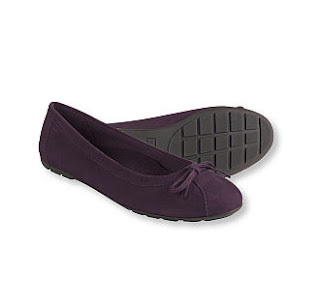 The LL Bean suede ballet flats are sturdy, but very flexible. I can wear them from 6 am until bedtime and it feels as though I am wearing slippers, but with lots of support for these big feet (a 10). Did I mention these are eggplant? I love this color. In fact, purple in almost any shade from lavender to aubergine, is my favorite color (you should see my all purple themeed Christmas tree in the dining room :). I haven't found anything cute and high quality in purple, so I was thrilled to find this color at LL Bean. I don't talk much about shoes here, but I just had to mention these to you!